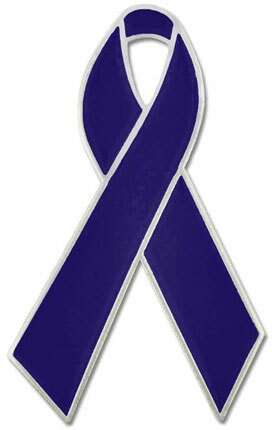 Eversince the spring of 1989 when a Virginia Grandmother namedBonnie began wearing a Blue Ribbon as a tributeto her grandson, a three year old whose mother's abusiveboyfriend killed him, concerned citizens all over Americahave worn the blue ribbon as a symbol to prevent childabuse and neglect. The Blue Ribbon Campaign has gained national momentum. Itis one way that everyone can play a role in the awarenessof violence against children -- in all its forms. By demonstrating your concern and commitment,others will want to wear the ribbon too. It's a powerfulway to rally everyone in your community to support publicawareness for child abuse prevention and programs that help parents and children. By wearing the Blue Ribbonpin you are making a difference for children! Love Our Children USA invites you to challenge people to display a blue ribbon in every business, every church and synagogue, every school, every hospital, and in every home... challenge kids and adults to wear their blue ribbons proudly. Please involve your neighborhood and community... ask everyone to respond to this national challenge. Learn about the issue of child abuse and encourage your friends to do the same. Please join the nation in preventing child abuse. Eachyear over 3 million children are victims of childabuse, and those are ONLY the ones that are reported …each year almost 1.8 million children are reportedmissing – many of them abducted from their own homesand front yards. Child abuse kills more than 3 children every day in the U.S.
Because so many cases of child abuse go unreported, it is estimated that the actual number of victims is 3 times greater than the actual reports. Children in the USA are more apt to die from abuse than from accidents. Violence against children comes in the forms of: physical abuse, neglect, sexual abuse, emotional and verbal abuse, abandonment, and death. Love Our Children USA is committed to raising awareness, educating the public. In order to make a bigger impact it is essential that communities all over the country get involved. In the year 2000, an average of 2,400 children each day were victims of child abuse. NUMBERS: Each week, child protective services (CPS) agencies throughoutthe United States receive more than 50,000 reportsof suspected child abuse or neglect. CHILDREN: No group of children is immune. Boysand girls are almost equally likely to experience neglectand physical abuse. However, girls are four times morelikely to experience sexual abuse. Children of all races and ethnicities experience childabuse. In 2000, more than one-half of all reported victimswere White (51 percent); one-quarter (25 percent) wereAfrican American; and 14 percent were Hispanic. AmericanIndian/Alaska Natives accounted for two percent of victims,and Asian/Pacific Islanders accounted for one percentof victims. Children of all ages experience abuse, but the youngestchildren are most vulnerable. Children younger than oneyear old accounted for nearly one-half (44 percent) ofchild abuse and neglect deaths reported in 2000; 85 percentof the children who died were younger than six years ofage. PERPETRATORS: At least 4 out of 5 victims are abusedby at least one parent. Bydefinition, perpetrators of child abuse and neglect arethe very people responsible for the child's safety andwell-being (including parents, other relatives, and babysitters). The most common group of people found to be responsiblefor neglect and physical abuse were mothers acting alone(47 percent and 32 percent of victims, respectively).In cases of sexual abuse, non-relatives and fathers actingalone are more likely to be responsible (29 percent and22 percent of victims, respectively). Source: U.S. Department of Health and Human Services, Administrationfor Children and Families, Children's Bureau (2002). Violence affects all of us whether we are directly involved or witnesses. No one ever deserves to be abused. Children are never to blame for the abuse and violence that are inflicted upon them. The price of each Blue Ribbon pin is $7.00 includingshipping and handling. Click Here to purchase online or call 212.629.2099 or 1.888.347.KIDS. We'll send your Blue Ribbon pins immediately so you can begin to raiseawareness for America's kids! For every blue ribbon that is worn across the country ... is another child in America who has bruises, who cries, who hurts, who is afraid, and sadly - who we may have already lost. ALL children so desperately need and want is love, safety, and nurturing! Child abuse is everyone's problem! Let's create beautiful dreams for our kids... instead of shattering them! Call or write your candidates and elected officials toeducate them about issues in your community and the needfor child abuse prevention, intervention, and treatmentprograms. Encourage your local school district and faith communityto sponsor classes and support programs for new parents. Reach Out To Kids And Parents In Your Community. Supporting kids and parents in your family and in yourcommunity helps to reduce the likelihood of child abuseand neglect. Be a good neighbor. Offer to baby-sit. Donateyour children's used clothing, furniture, and toys foruse by another family. Be kind and supportive, particularlyto new parents and children. If you even suspect abuse or neglect report it—andkeep reporting it—until something is done. Contactchild protective services (in your local phone book) oryour local police department. Build a support network by getting involved in your neighborhood. Develop friendly relationships with your neighbors and their children. Problems often seem less overwhelming when you have support nearby. Get involved in your child's school. Join the parent-teacher association and attend school events. Talk to your friends and neighbors about to stop violence against children.